Showcased 11th April 2017 What is this? 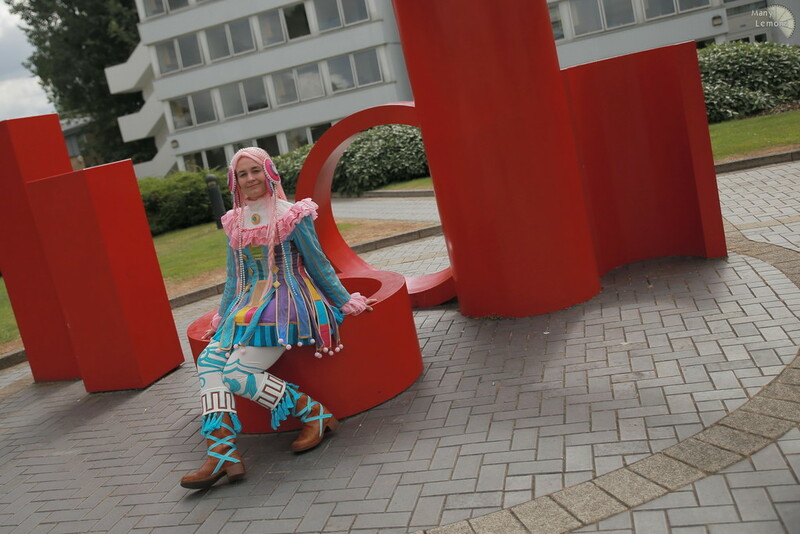 I fell in love with this colourful design and made it my big project in late 2015, first wearing it at MinamiCon 2016. 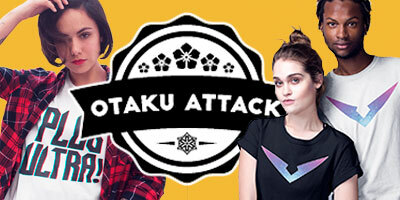 I spent a long time planning it and gathering materials and although I didn’t use many new techniques, almost every aspect took a lot of work. 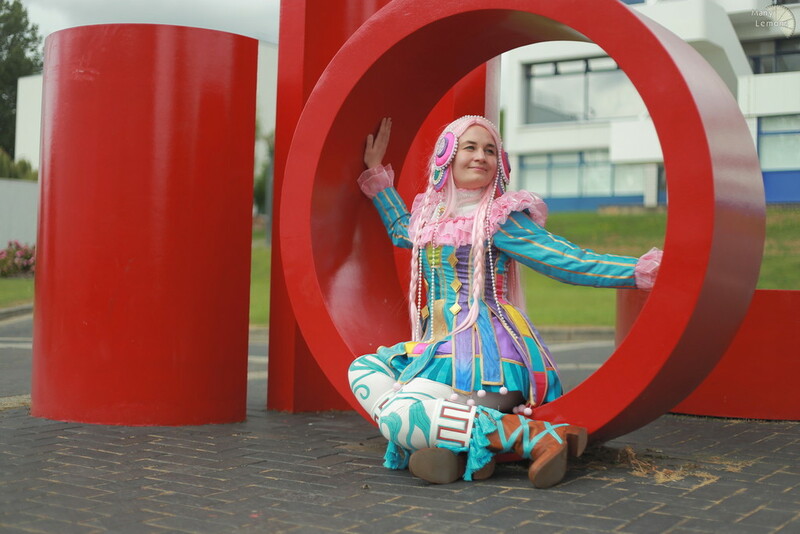 The dress, petticoat, leggings and top are all made from scratch, including dyeing, lots of hand sewing and painting. 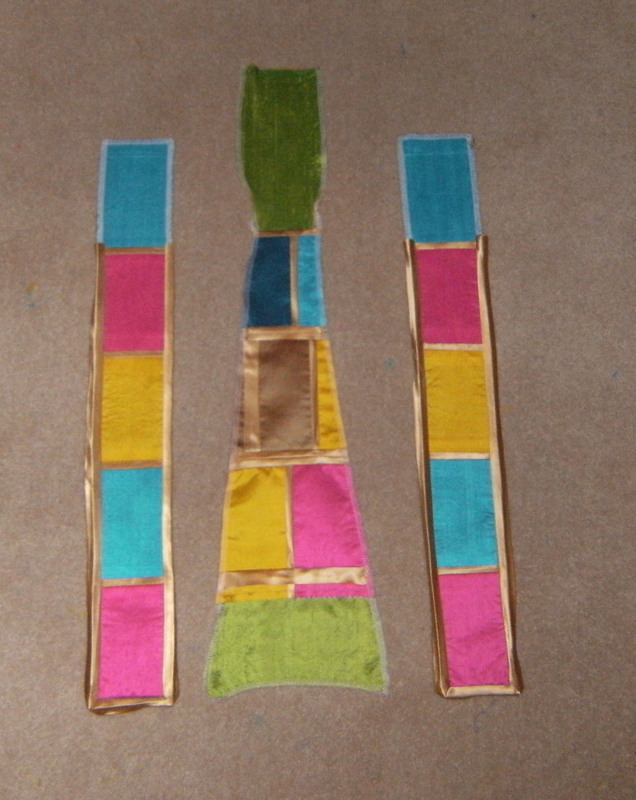 Even the boots were dyed, required careful applique and a lot of tassel-making. It may be a simple style, but because I was adapting a wig I already owned I had to spend quite a bit of time on it too. Patterning out the dress was the first challenge, I experimented with my initial mock-up to draw on where the striped panels should go and came up with an approach to overlap the strips for the skirt at the waist so that the panels were narrow enough at my waist but wider at the skirt. After finalising my layout for the stripes on the dress, I cut apart the mock-up, added seam allowance and did a full trial run using some polycotton with some spare bias tape to make sure my construction method would work ok. That second mock-up was then used as my pattern on the final fabric. 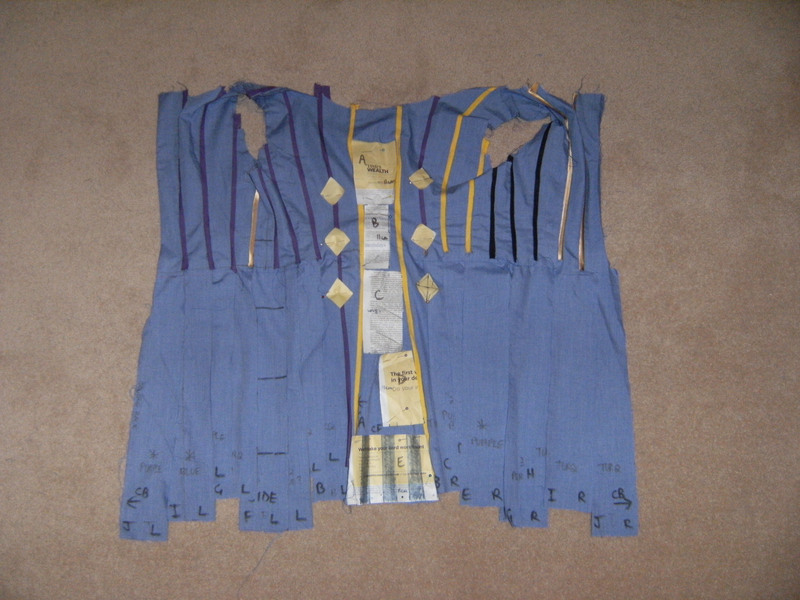 Because all the panels vary in length and the dress isn't symmetrical, each panel for the dress is unique so there are 19 individual pieces which all had to be carefully labelled. I also had to determine which would be what colours and keep track of it all when cutting the fabric and dyeing it. I chose dupioni silk for the dress as I liked the idea of the texture, it’s available in lots of vivid colours and using silk meant I could dye some too and create the watercolour gradient effects. I started with turquoise and white dupioni and used blue, purple and turquoise Jacquard acid dyes. The turquoise dye was used to darken some of my turquoise silk and I also used it on the white silk to create a more vivid shade for some pieces. 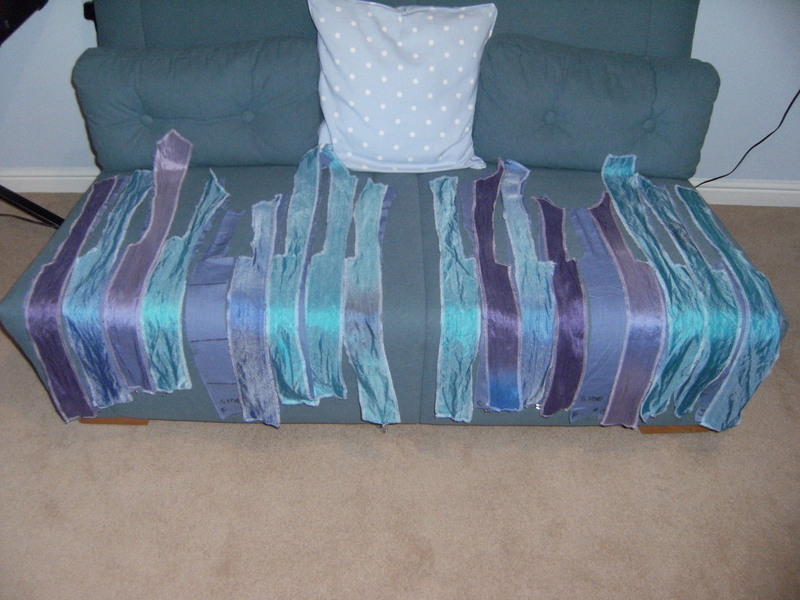 I bought more cuts of silk for all the colours on the front and sides. Only the pink fabric is synthetic. I made all my own gold bias binding and I think ended up using over 30 metres. The edges of the skirt panels were finished by hand. I bought a pack of pom poms on Ebay and used embroidery floss to attach one to every corner of the skirt panels. The buttons for the dress are craft foam and attach with snaps. For the dress lining, I used acetate satin, shiny side inwards. I dismantled half of my first dress mock-up to use as a simplified pattern for it. The lining is the visible underskirt showing between the strips on the skirt. 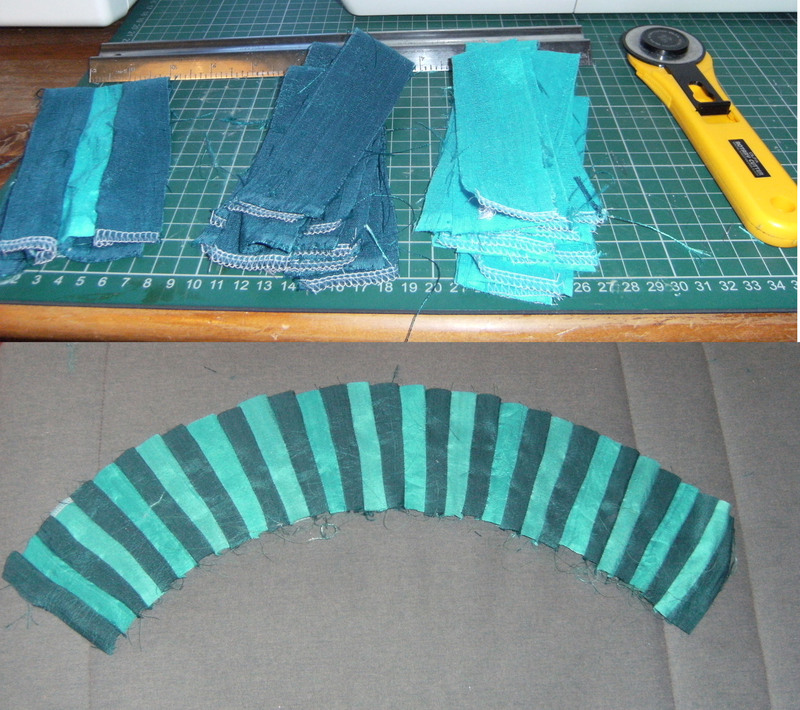 I cut loads of little teal/turquoise strips to make the striped hem which goes the whole way round. The pink ruffles are alternating layers of two different synthetic organzas, to be as shiny and sparkly as possible. They were roll-hemmed and gathered using my overlocker. 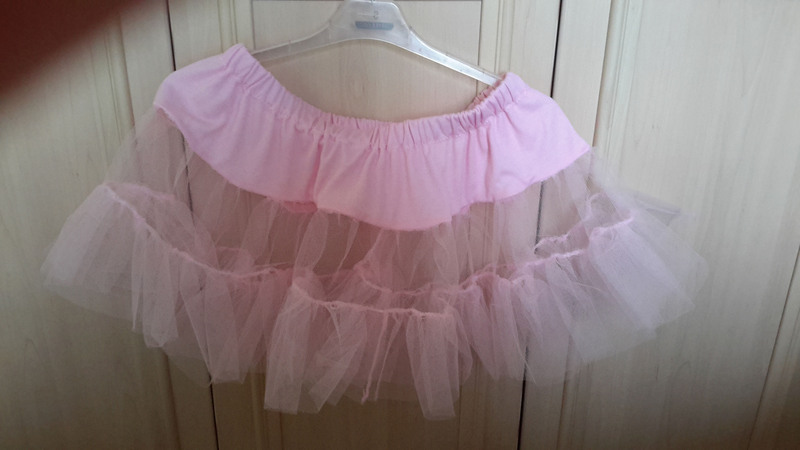 I made the petticoat from pink jersey and net which was also quickly gathered and assembled with the overlocker. 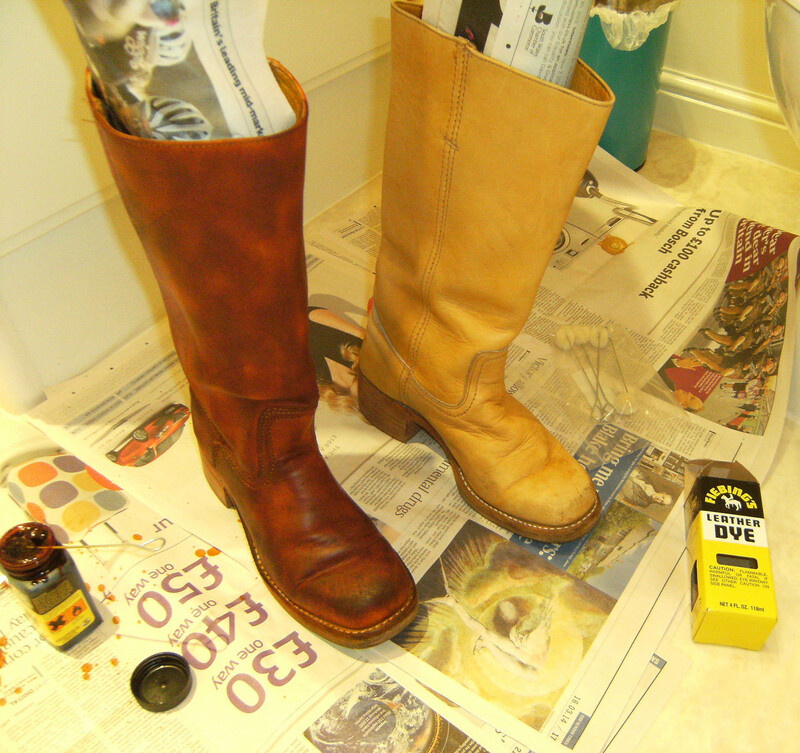 I bought the boots on ebay and I used some Fiebing's leather dye to get them to the right shade. 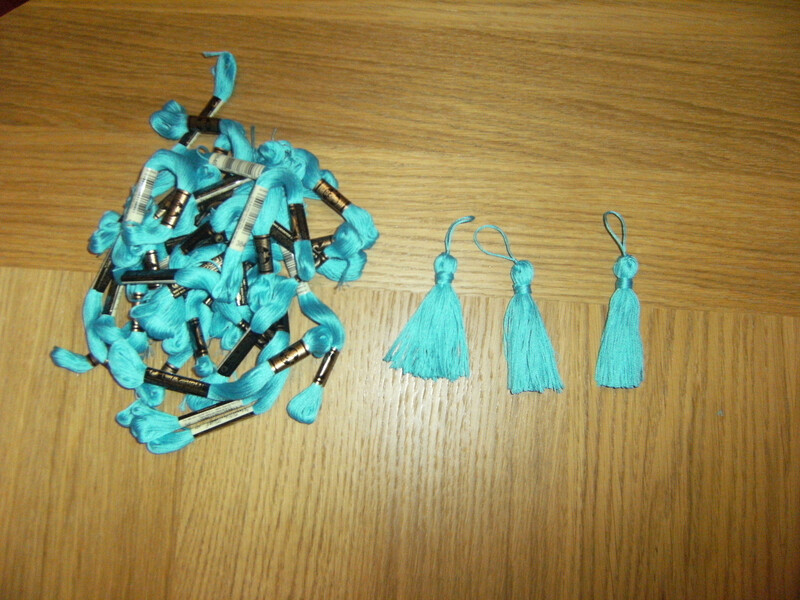 I made bias tape from my turquoise dupioni then carefully measured and glued it on. The cuffs are made from the jersey used for the leggings and top, which was interfaced. I carefully cut out the brown pattern from felt and applied it with Bondaweb. I then used a zig-zag stitch in matching thread to secure it along the lower edge, and a turquoise satin stitch along the top. There are 14 tassels on each boot, each one made from a pack of embroidery floss. I used cream jersey for the leggings and the turquoise designs are Marabu fabric paint outlined in brown Letraset marker. The top is the same jersey but fused to a non-stretch fabric at the collar to support all the beading. 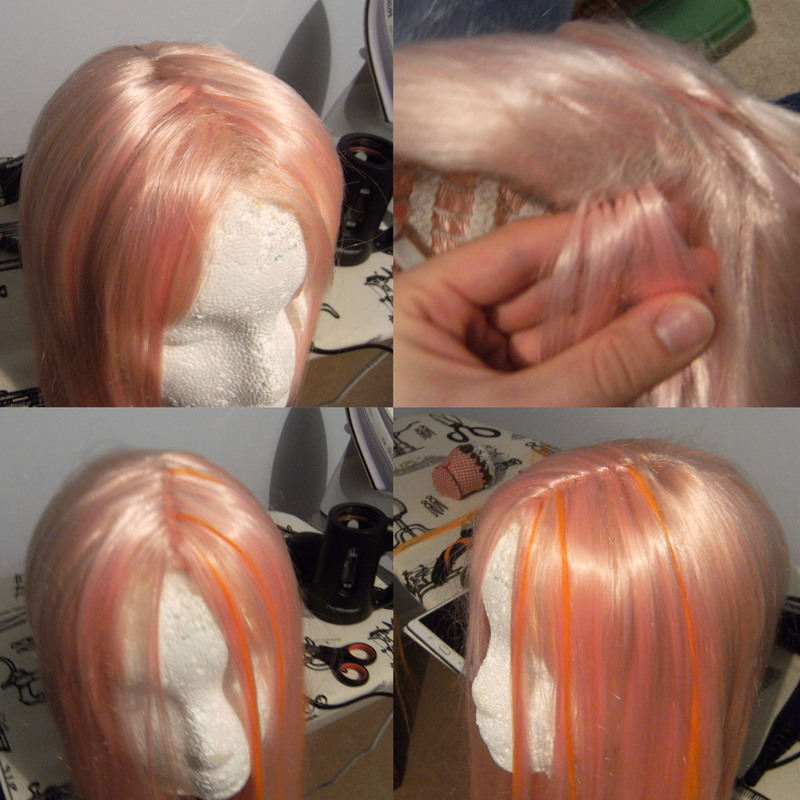 I marked out where the beads needed to go and used the same strands of beads as on the wig. I could use a beading foot to sew all of them down by machine except for the small ovals on the collar which were done by hand. There's a short zip down the back. I also lined this area to protect and cover up all the messy threads from beading and to neatly finish the organza ruffles around the neck opening.The pendant is made from a couple of buttons I stuck together and painted, with a spare clear resin gem I'd cast for another project which I backed with turquoise fabric. It attaches to the top with a snap. I started with a Maple Wigs wig which I've had for years and added extensions from Coscraft for volume and to allow me to part the fringe and pull it aside. To create the parting I pulled in strands with a wool needle. The orange streaks were done with a Letraset permanent marker. I bought a strings of various sizes of beads on ebay and secured them to the wig by pulling the ends through the mesh and sewing them in place. The headpiece things are made from Wonderflex to create the raised shape and are covered in leftover fabric from various parts of the costume. The central bits are craft foam ovals also covered in fabric and finished with bias binding, then with rhinestones glued on. The finished discs attach to the wig with safety pins. Way back at the start, I dismantled half of my first dress mock-up to use as a (much simpler) pattern for the dress lining. I added a seam at the waist and cut the skirt pieces with fewer seams (only side seams and the centre back) and the bodice just has princess seams. The lining also acts as a visible underskirt, showing between the strips on the skirt. Early on I’d decided I didn’t want to secure all the skirt strips together to made a solid skirt, so I knew I’d need an underskirt of some sort. It's made from purple satin (from Edinburgh Fabrics) with the shiny side facing inwards, so the more matte side shows on the skirt. All the edges overlocked in pink which is the thread colour of choice for this costume. Later in the process, I had plenty dupioni scraps left so rather than only have a teal/turquoise striped section at the centre front hem, I decided to continue it all the way round – extrapolation from the reference image. 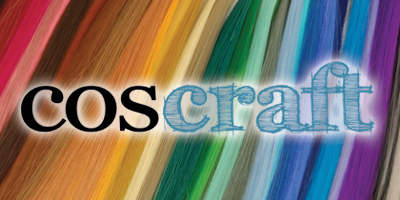 I cut rectangles from lots of colours and considered having blocks of different shades e.g. the teal/turquoise that shows at the front, then maybe red/yellow further round but in the end I decided I liked the teal/turquoise best. I cut a heap of rectangles with my rotary cutter, and sewed them together, tapering the seams a little since the skirt widens towards the hem. The striped panel has its top edge finished with gold bias binding and the bottom edge was sewn to the skirt right sides together, understitched and flipped up then topstitched in place. This was a great way to finish the curved hem of the skirt. 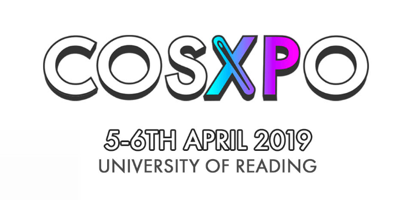 It was fiddly, especially getting the correct taper to the panel, and dealing with a million little pieces of silk fraying, but I’m glad I persevered and did it. I went through a phase of buying all sorts of pink sheer fabric that I came across. These synthetics are always so cheap, it was easier just to buy a metre or two when I ran across another possible fabric than be selective about my ultimate choice. I liked having several fabrics to play with and experiment with layering. This is a rare case where I felt choosing nasty synthetic stuff was better than silk organza since I actually wanted the much more obnoxious bright shiny/iridescent fabrics. Those ruffles are so ridiculous, I decided the best way to cope was to embrace it and make them as sparkly and shiny as possible. I eventually used 2m of some synthetic organza from Remnant Kings - this was great because it's fairly opaque, and then I used 1m of crystal organza from Cheapfabrics.co.uk on top. I tested out flounces and/or gathering and settled on tightly gathering rectangular strips since flounces weren't giving enough gathers and it was also a lot easier to cut straight lengths. I used alternating layers of the two organzas. The crystal organza was the best colour, but not opaque enough alone, so it's layered on top of the other organza. The two shades also help to distinguish the layers as does the roll hemming. At the collar there is one base lightly gathered section which has a row of narrow ruffles at the hem. Then two progressively shorter ones on top and another two rows of narrow ruffles around the collar. Similarly, at the wrists I decided on one longer base layer of the more opaque darker pink organza, with the paler sparkle organza on top. My overlocker was invaluable for roll-hemming all the organza and doing the gathering. The buttons for the dress are craft foam. I decided to cut out a smaller diamond to place on top of the larger one, rather than making a raised rim, because a) it's much easier to cut out and b) I was able to sew on a snaps to the backs for attaching them to the dress and then stick the diamond on to hide the threads. I thought this would be more secure than glue alone. They're primed with layers of pva glue then I used had acrylic paint and finally clear varnish. I couldn't decide between bright yellow like the art or a more realistic gold. I found yellow looked odd against all the gold bias binding on the dress so chose the yellowish gold acrylic I happened to have as a compromise. After many fabric samples, pattern frustration, cutting, dyeing and endless bias tape, I was finally ready to assemble this dress. I sewed down one side of the bias binding by machine and left the other side unsecured to finish by hand later, so hand sewing aside, the construction went pretty quickly after all my preparation. There’s a lapped zip for the closure, concealed by bias binding at the centre back. I had a lot of time off over Christmas so tried to get everything on the costume completed to the point that I could do all my hand sewing then when I was visiting my parents. I finished all the bias binding on the dress and bought a back of 50 pom poms on Ebay and used embroidery floss to attach one to every corner of the skirt panels while sitting in front of the tv over the holidays. For the multi-coloured rectangles at the centre front and sides, I bought some small cuts from Edinburgh Fabrics and some assorted fat quarters online from the Silk Route. 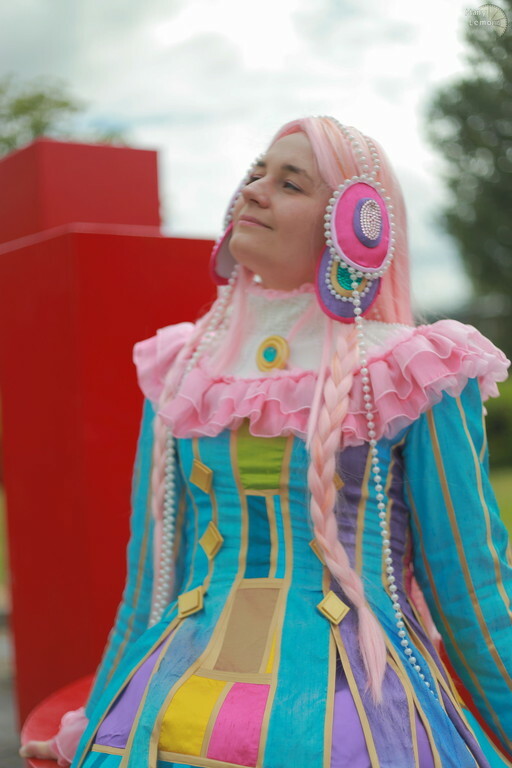 I dyed the brightest turquoise myself - it's the same dye I used to darken the main turquoise fabric for the dress, but I applied it to the white dupioni so it basically is the same colour but more vivid. The lime green fabric was really only for one section at the top, but I made more use of it because I liked it. It’s the lining for the side panels as well. After many online samples and ventures to assorted fabric shops, I finally bought my dupioni silk. 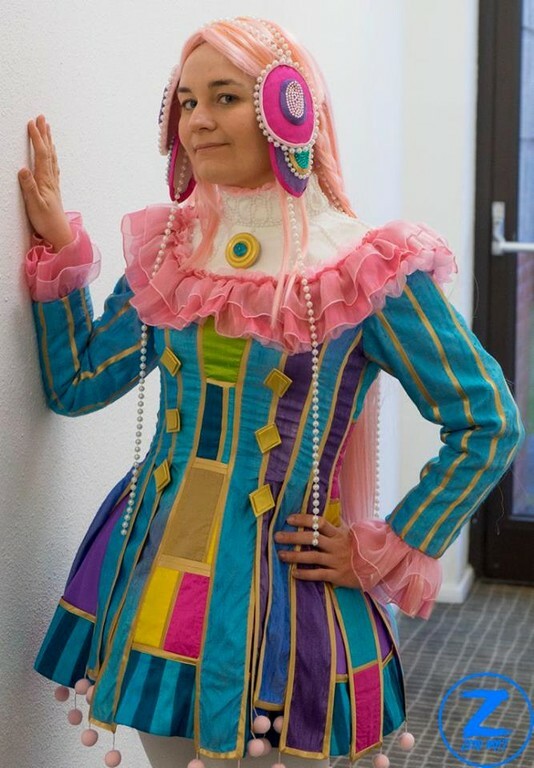 I was immediately fixated on the idea of using dupioni for this costume. 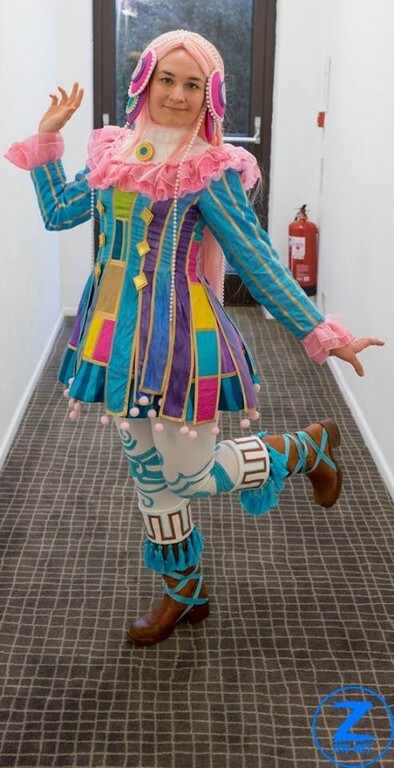 I liked the idea of the texture and having the grain run vertically down the striped panels of the dress, maybe having other pieces with it horizontal for variety, and it's a practical choice too because it comes in so many vivid shades so I'd be able to have all the colours on the costume in the same fabric. Using silk would be helpful too since I could dye it and create the watercolour gradient effects. I already had blue and turquoise Jacquard acid dyes so planned around that and bought purple dye as well. That minimised the different colours of fabric I needed to buy. I bought 3 yards of turquoise and 2 of white from an Etsy seller - the price was in USD making it much cheaper for me at the time. I did think about dyeing all of the main turquoise fabric myself, but evenly dyeing larger amount of fabric becomes trickier and there are so many lovely coloured fabrics out there it was easier to rely on them. I still ended up using my turquoise dye to darken the fabric I bought slightly and to create some varied shades on some panels in addition to the main dress colour. I had labelled all the pieces from my mock-up in permanent marker with a letter, they were all in alphabetical order and marked left and right sides. I also wrote on which colour fabric to cut each piece from and what colour dyes were required for each piece which helped to sort them out as I was dyeing everything along with referring to my reference image. These mock-up/pattern pieces were then safety-pinned to my final silk pieces and remained attached throughout the dye process until everything was finally sewn together. That ensured I didn't lose track of any pieces and could keep them in order to sew to together correctly. As I cut them out, I overlocked the edges of every piece because they'd be handled a lot both during dyeing and while finishing all that bias binding by hand and dupioni unravels horrendously - especially as I was set on cutting it with the grain vertical. After cutting and overlocking all my pieces, I dyed certain ones which I'd cut from white fabric. Other panels were cut from turquoise and had some areas dyed too. I liked working with the small individual panels and I had enough fabric to cut more than one of them when needed and pick the ones which turned out best once dyed. I had 3 colours of dye in pans and it was easy to deal with the small individual pieces, dipping each one to create gradients and experiment. I had to do my purple pieces twice since they weren't dark enough initially and I also ended up dyeing all my turquoise fabric darker too. 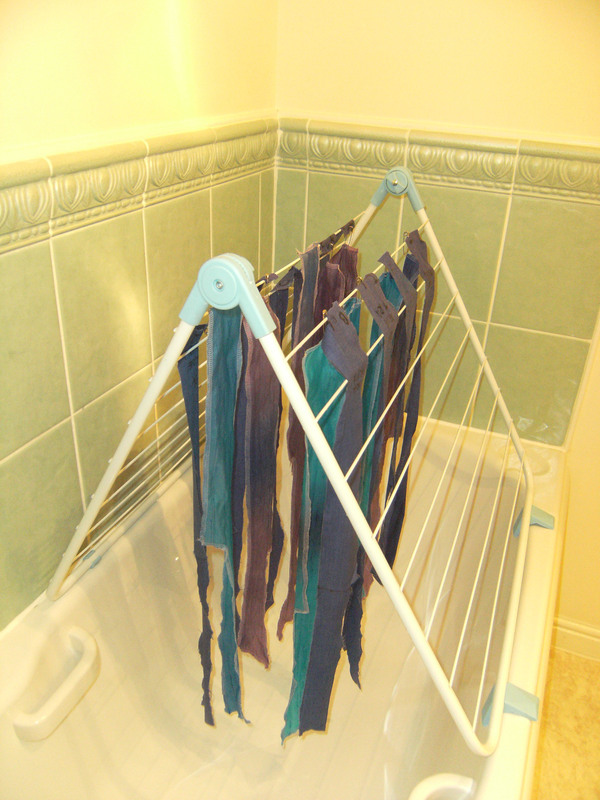 They all were left hanging over the bath to dry as pictured. And sewn together! With bonus paper pieces where I was beginning to plan out the front panel proportions. I was relieved when I compared the assembled pieces to my lining pattern and they'd come out the correct size and when it was complete it all still fitted ok. For the purposes of the trial run I just wanted to ensure the bodice fit and didn’t need to run the bias binding all the way around the edge of each piece, but it helped me wrap my head about how to assemble everything. I also spent some time experimenting with the lengths of the skirt panels which needed to all be varied. I couldn't leave this until after assembling the final dress because the bias binding needed to go all the way round each rectangle as part of the construction process, so they had to already be cut to the correct length. Because all the panels vary in length and the dress isn't symmetrical, that means each panel for the dress is unique so there are 19 individual pieces which all had to be carefully labelled. I also had to determine which would be what colours - I had free rein to make up the back. I based the panels at the sides off the in-game design. 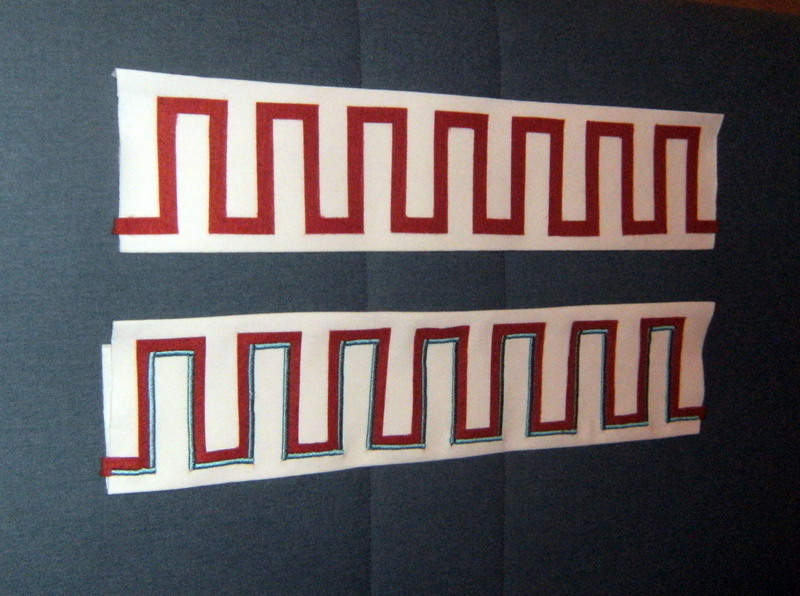 Similarly, the sleeves were sliced into multiple panels, but I didn’t do a trial run since they were much simpler. I started with New Look 6567 - a basic dress with sleeves - and made it with fabric from an old duvet cover. It was adjusted to fit and cut a lot shorter. I needed to extend the skirt to flare out more, so I measured the circumference of a petticoat I had which looked about right, then I inserted godets at every seam to evenly expand the skirt out to that measurement. I then started experimenting with drawing on lines to mark out where the striped panels should go. The sleeves were straightforward enough, but I quickly realised that translating the skirt into reality wouldn't be easy. The main issue is that the amount of stripes of a suitable width that I can fit on the bodice doesn't amount to enough panels to cover the much broader skirt area below. Flaring the panels towards the hem didn't look right, and regardless, there still wouldn't be enough strips. After some trial and error pinning loads of rectangular strips on the skirt, I came up with an approach to overlap them at the waist. This makes the panels narrow enough at the top to fit around my torso, but they're wider at the skirt and they remain an even width all the way down. I also experimented with securing some of the panels all the way down their sides to keep them in place while leaving most hanging free from the waist. I primarily wanted to ensure the strips at the centre front where the coloured sections would need to be exposed would stay put. Reflecting on it, it's maybe quite an obvious solution, but I'm still pleased that I came up with something it's possible to sew but has some of the illogicalness of the drawing, so I think that's quite a successful interpretation of the design. 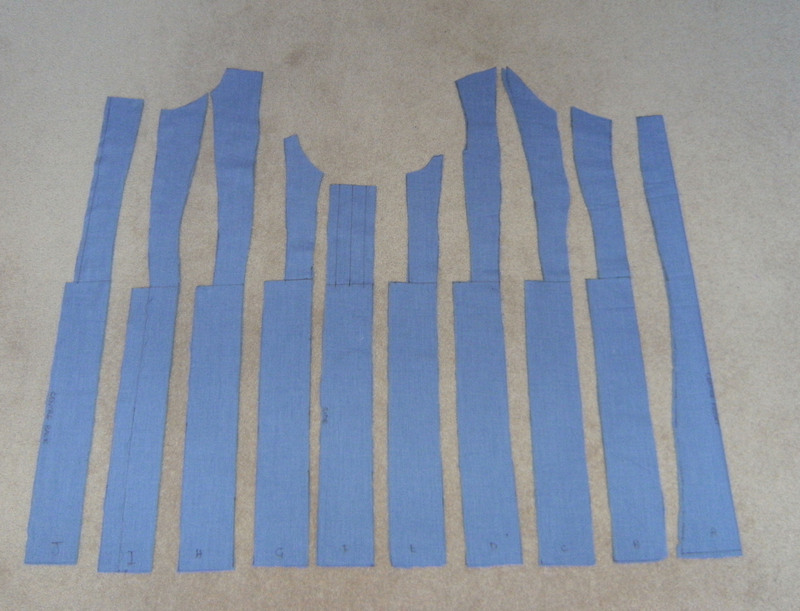 After finalising my layout for the stripes on the dress, I cut apart the mock-up, added seam allowance and did a full trial run using some polycotton with some spare bias tape in assorted colours to make sure my construction method would work ok. Photo shows the pattern I ended up with. That’s half a dress, with the centre back on the left and centre front on the right. There are 14 tassels on each boot, each one made from a pack of embroidery floss so after determining the best colour to match my fabric in a shop, I then sneaked off and bought them all in bulk on ebay. The cuffs are made from the jersey used for the leggings and top, which was interfaced. I carefully cut out the brown pattern from felt and applied it with Bondaweb. I then used a zig-zag stitch in matching thread to secure it along the lower edge, and a turquoise satin stitch along the top. 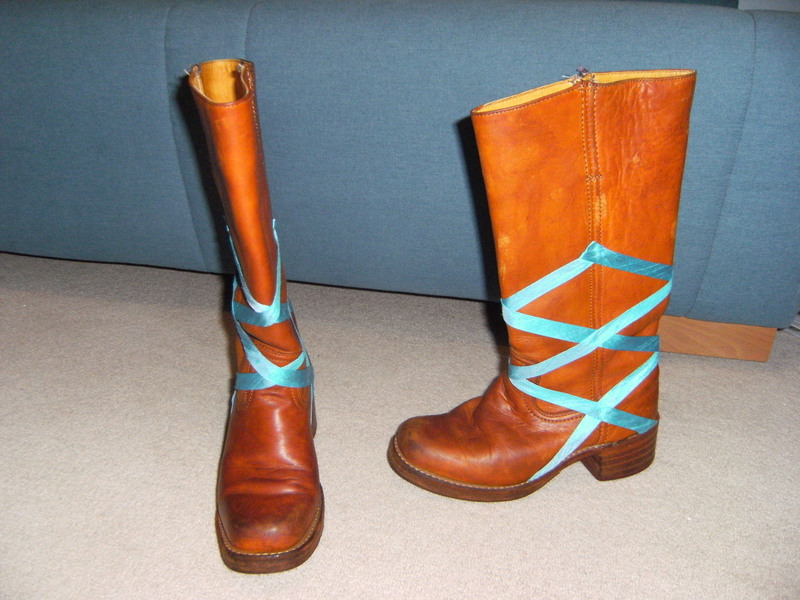 I cut bias lengths of turquoise dupioni, ran it through my bias binding tool to fold the edges under, then glued it to the boots, after spending far longer than I expected measuring and figuring out how to criss-cross it evenly. I bought the boots on ebay cheaply. They were paler than I liked so I used some Fiebing's leather dye, which also spruced them up a bit, making the scuffs less obvious. They don’t have a zip so that was ideal for adding the cuff at the top. I already had a petticoat I could use for the costume which I used for fitting the initial mock-up, but I had to roll it up at the wait to be short enough, so since I had time I bought pink netting and made my own pink petticoat to just the right length. I made a yoke from some spare pink jersey fabric with an elastic waistband. I then attached two short tiers of gathered net. It took a bit of experimentation to get the right volume, but it was all quick and easy enough, especially with the overlocker to do all the gathering. The undershirt is the same jersey as the leggings, but I fused it to a non-stretch fabric at the collar to support all the beading. I patterned it out by copying a t-shirt, then adjusted it a bit to allow for the non-stretch neckline and the high collar. When I was happy with the fit, I cut out my pieces and used Bondaweb to fuse the jersey to its underlining. I chose this approach over trying to persuade the rubbish interfacing I had to stick to stretchy fabric. I initially made it long-sleeved because I’d thought about sewing the wrist ruffles to it rather than the dress, but I think it was a good idea to leave it like that as it’s a good base layer underneath the dress. 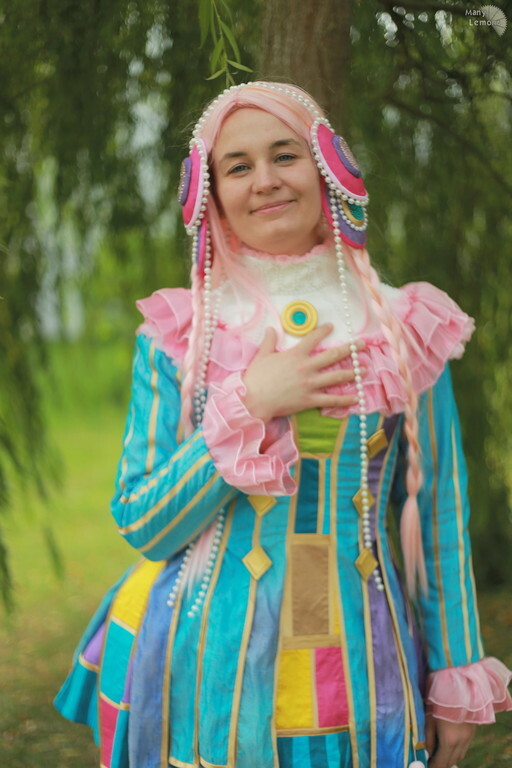 After wearing the costume, I can simply hand wash the top and the dress shouldn’t need much freshening up. I marked out where the beads needed to go and used the same strands of beads as on the wig. 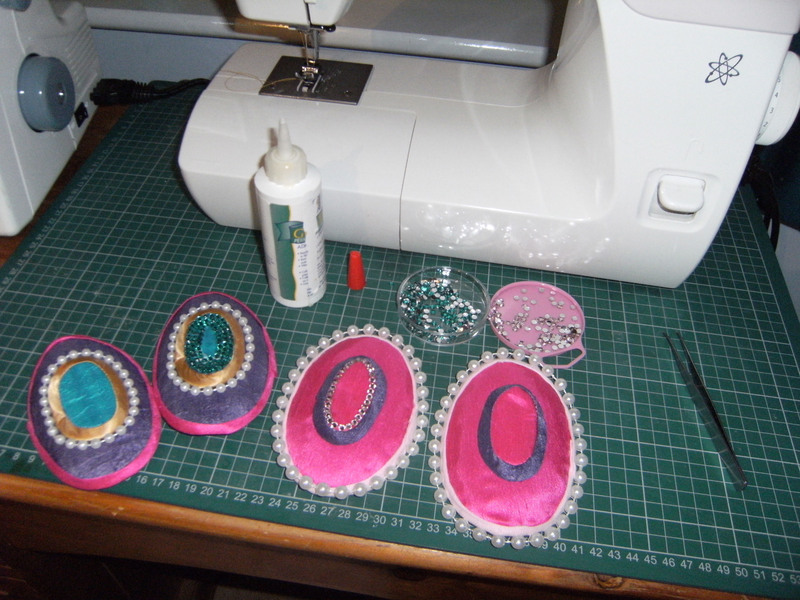 I could use a beading foot to sew all of them down by machine except for the small ovals on the collar. Those all had to be done by hand. The pendant is made from a couple of buttons I stuck together and painted, with a spare clear resin gem I'd cast for another project which I backed with turquoise fabric. It attaches to the top with a snap. There's a short zip down the back. 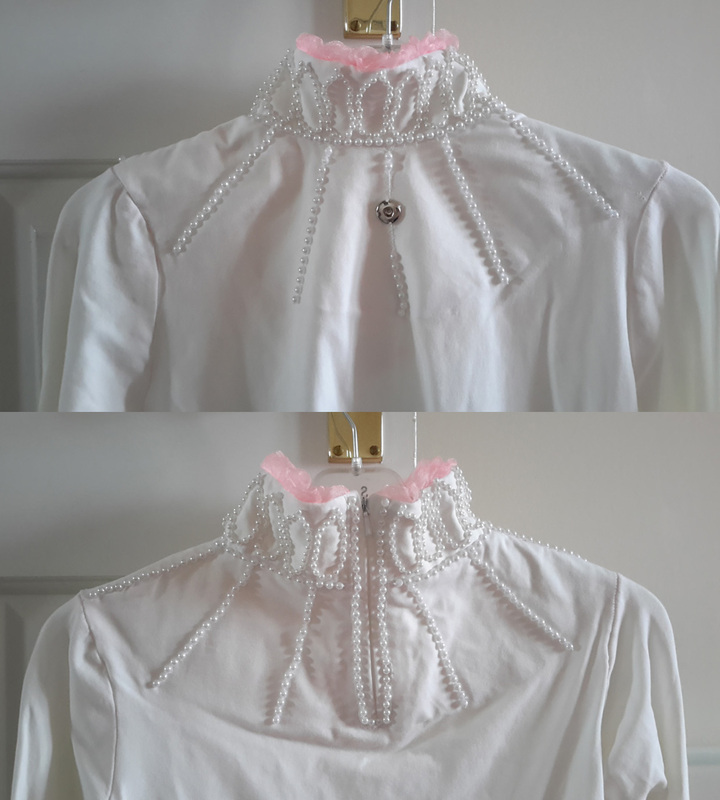 I also lined this area to protect and cover up all the messy threads from beading and to neatly finish the organza ruffles around the neck opening. I was going through a phase of flatlocking everything so the hems are all finished this way with pink thread as a pseudo-coverstitch look. In the reference, the leggings and undershirt are the same colour as her face. I suppose they could be designs actually on her legs and a bunch of jewellery at her collar, but I much preferred the idea of applying all that to clothing and not my skin! I couldn't decide whether to use white or pink fabric, and initially tried dyeing white cotton jersey (a lucky discounted remnant find in Remnant Kings) a very pale pink myself using a tiny bit of Dylon's machine dye, but I wasn’t too happy with it and ultimately settled on a cream jersey from Edinburgh Fabrics. I copied an existing pair of leggings to make the pattern, basted it together to check the fit and marked where my skirt and boots finished on them. I planned out the turquoise designs on paper – I had to make up the back - and went over them in dark pen once I was sure of the lines. As the fabric was white, I could see the lines through it ok to be able to trace it. At first I thought I might paint the leggings flat, but decided it’d be a pain matching up the lines of the designs at the seam, so I kept them basted together, folded up and shoved my paper design template inside the leg and rotated it as the sections I’d painted dried. I used Marabu fabric paint and outlined the designs in brown Letraset marker. Once the painting was complete, I overlocked the leggings together properly and added the waistband. I wanted the discs on the side of the head to be a raised shape. I wasn't sure how I was going to do that and kept an eye out for oval-shaped objects to possibly use as a base. It wasn't easy to find anything oval, but luckily I ran across a soap dish in a pound shop which I thought was about the right size and shape. It was a bit too big for me to be able to buy 4 dishes to use as bases, but I was able to use it instead to mould some Wonderflex. 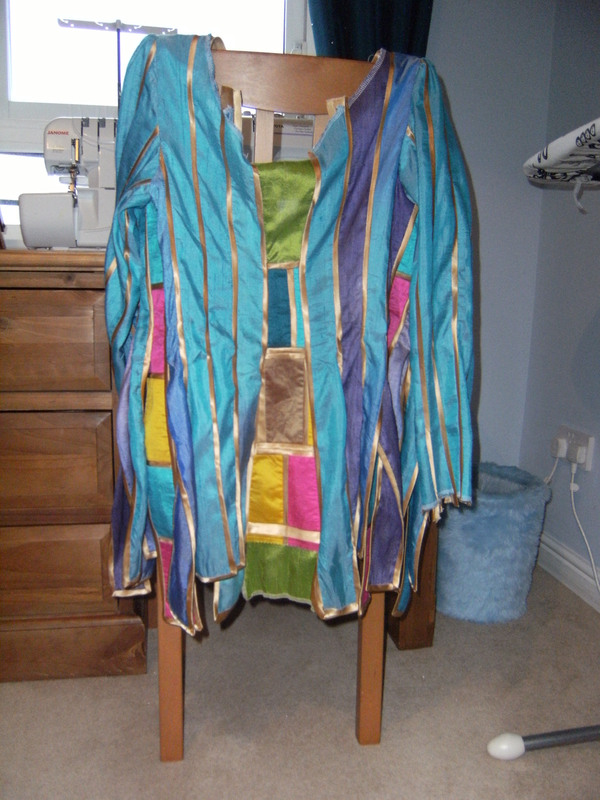 The Wonderflex was then covered in leftover fabric from various parts of the costume. I also made some bias binding which when glued on nicely finished the edges. I had dyed some bias strips purple when I was dyeing the dress fabric with this in mind. The central bits are craft foam ovals also covered in fabric and finished with bias binding, and with rhinestones glued on. I liked the idea of using rhinestones since the centres seem to be textured in the reference. I also sewed on the strings of beads by hand. The finished discs are attached to the wig with safety pins. 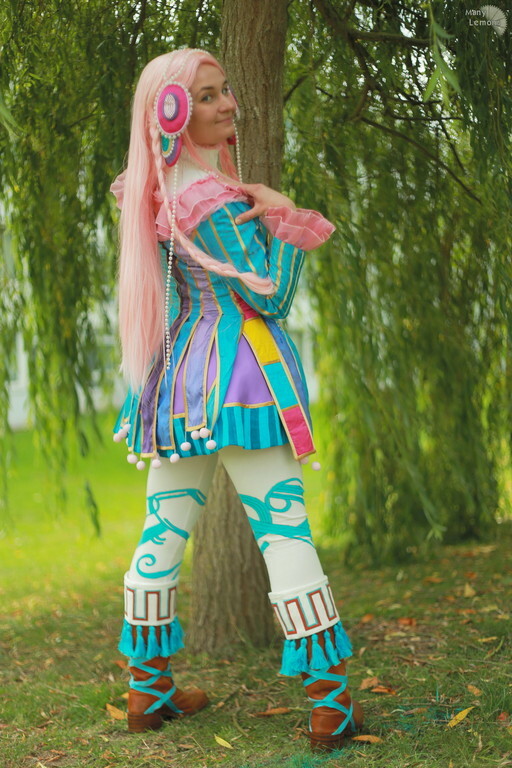 This began as a pink wig I already had, a lovely purchase from Maple Wigs which I've had for years. 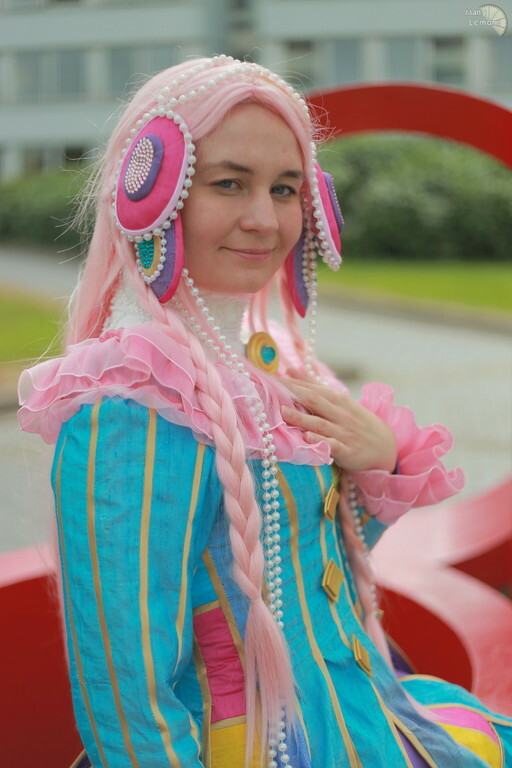 I decided to add in some extensions from Coscraft for volume - those braids require a fair bit of hair - and to allow me to part the fringe and pull it aside. The extensions are a slightly different shade but are distributed throughout the wig evenly enough so it isn’t obvious. To create the parting I pulled in strands with a wool needle, which is what the photos her show. The orange streaks were done with a Letraset permanent marker. 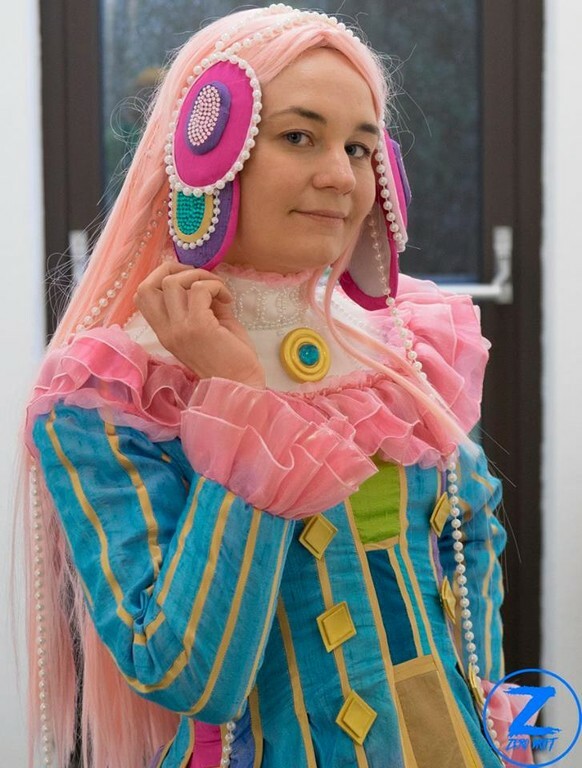 I bought strings of various sizes of beads on ebay for both the wig and top, and secured them to the wig by pulling the ends through the mesh and sewing them in place.